Hey gang, I hope you're all doing well. A real quick one from me today as in all honesty I don't have much to say in the way of thoughts and feelings so thought it would be nice to simply talk you through this look that I've been enjoying wearing recently. But before I get started I must say a huge thank you to everyone for the beautiful comments across the last few posts, it really means oh so much that you've been enjoying my blog, as this place is my little baby (or small child since it turned 5 this month), so yeah, basically it means a lot and thanks from the bottom of my little Northern heart! So, lets break down the look now shall we. Let's start with what's on my head or should I say what seems to be surgically attached to my head. I simply cannot get enough of Baker Boy Caps and it would appear that many of you lot can't either, which is a delight to see having loved and worn one myself for so many years. 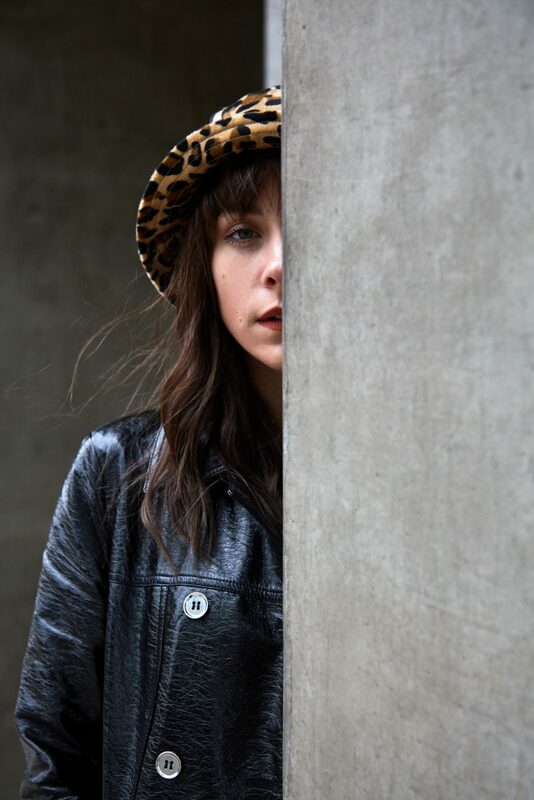 It's amazing for me that the high-street are rocking Baker Boy Caps left, right and centre as it means I can add to my ever expanding collection of head wear. This is the latest and I must say, my favourite head piece in quite some time. It's pink for a start and anything pink is A-Okay by me, but it's also corduroy which is one of my all time favourite fabrics as it oozes seventies flair. 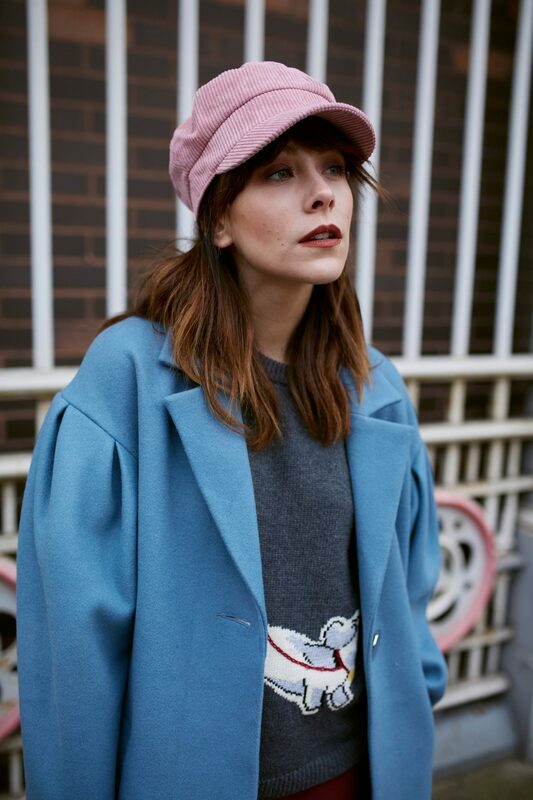 It's a huge trend for the season so a corduroy cap IMO is a really nice way to enter into the seventies fabric trend, whilst combining an accessories trend too. Not to mention it protects my little pea head from all kinds of Mancunian weather, which is usually rain and gail-force winds lets be real here AND bonus points, it's a saviour for bad hair days too. 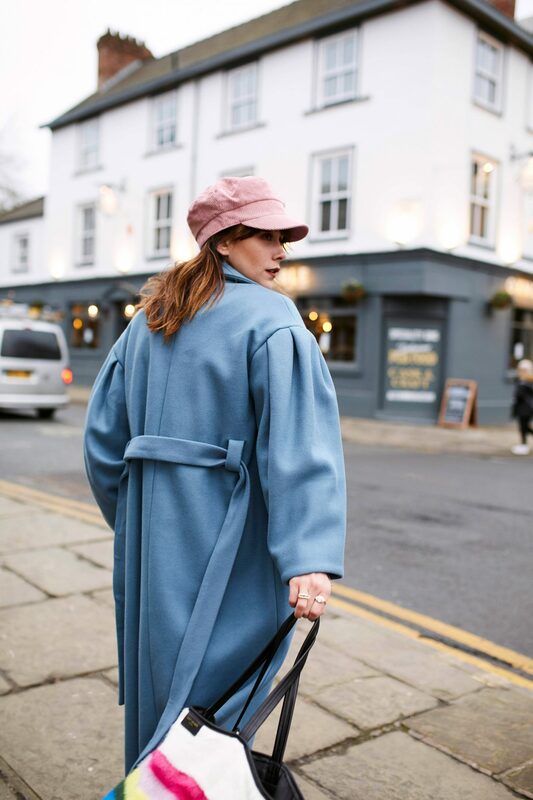 Now lets talk about the coat, ohhhh the beautiful forties blue coat and quite frankly a coat I bought as I knew that forties blue was forecasted to be the must have colour for AW17. 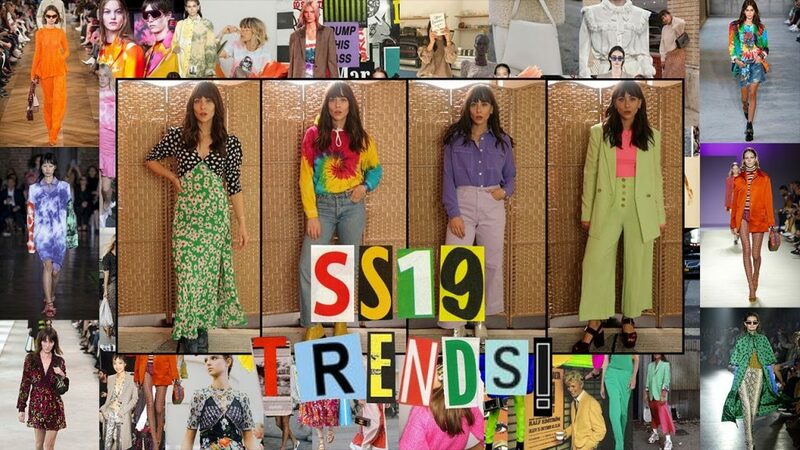 And whilst the catwalks were awash with all things forties blue, it's one trend that the high-street have unfortunately failed to pick up on. 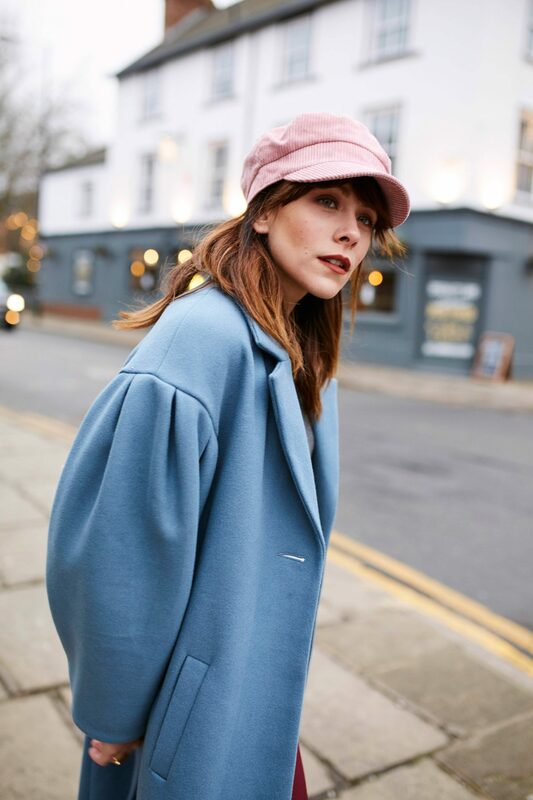 It's been tricky to find almost anything featuring the oh so beautiful vintage hue, that was until I found this coat lurking on the Topshop website. 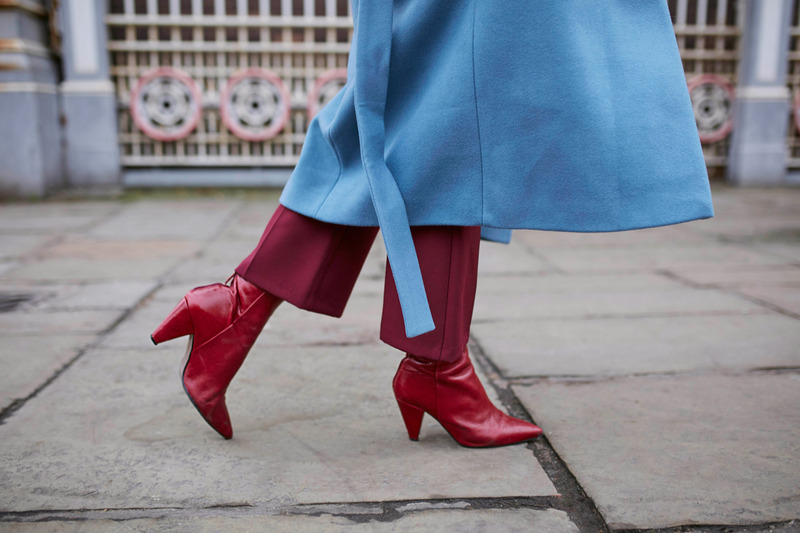 It's been love ever since, it's oversized and relaxed shape with balloon style sleeves really lends itself to the forties era alongside the beautiful dusty blue shade. The single button fastening creates a somewhat masculine and undone feel whilst the tie waist allows the coat to be transformed into a totally different silhouette entirely. And despite the forties blue shade being less available as originally forecasted, I for one am pretty chuffed about it as it means not everyone is rocking the "trend" colour of the minute all at once. The fine knitted jumper is a piece that I was kindly sent from my loves at Cath Kidston, a brand I've cooed over for countless years. When the latest Sausage Dog collection was released I was of course extremely keen to add a piece to my ever growing Dachshund collection, but Cath Kidston came up trumps and sent over THE.ENTIRE.COLLECTION! It's safe to say I was one happy sausage mamma and my wardrobe and home have benefitted from it a lot! Tying in the burgundy accents within the seriously cute novelty knit I paired what one might call the best sale find of all time in the form of these Topshop Kick Flares. Quite honestly the most flattering pair of trousers in all the land I was completely thrilled, and a little confused as to why they were in the sale in the first place. They're high waisted and in turn leg lengthening, stomach skimming and just a beautiful mash up of retro meets contemporary with the gun metal hardware. SO many of you purchased these when I featured them in Sunday's January Sale Haul Video so I know that you love them as much as I do... What a find! This is the kind of thing I've been wearing a lot lately, it's the perfect mix of smart casual. A look that can be worn for simply shopping with friends or for lunch with your bf/gf but can also double up as a seriously cool work look or evening out look, simply mix up the accessories if you so wish. Well isn’t this coat ABSOLUTELY AMAZING? Love the colour, love the shape – looks brill. That coat is lovely and quite unique. I have always though red+blue to be a horrible combo, but, gurl, you make it work like no other! Just ace! Fun colours, seasonal textures, styled with sass and femininity. Love it! WOW that coat is everything! Soooo beautiful! I’m all about the forties blue (all about everything that has a retro vibe actually lol), I decided that I need a piece in that colour asap. I love how fearless you are with color, Megan! I love wearing colors, but I don’t know if I would have thought to put the pink, blue, and burgundy all together like you did. Taking some inspo from this outfit for sure! 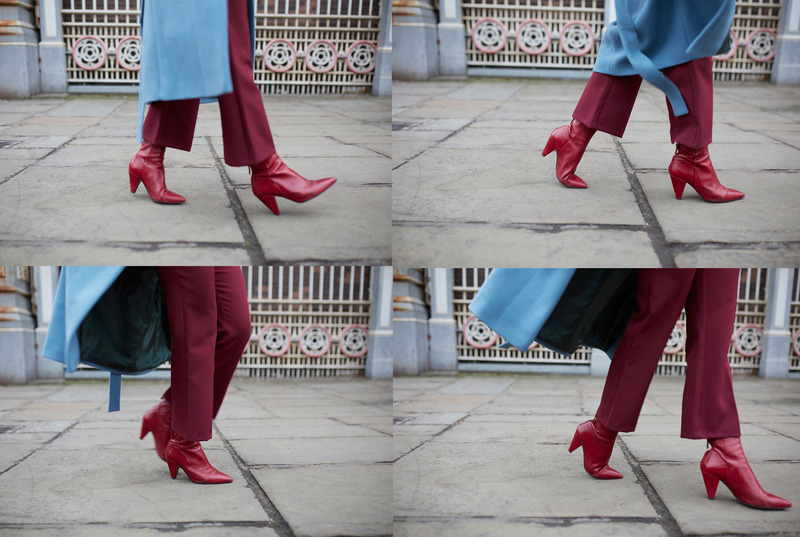 Definitely agree about the high street’s huge fail when it comes to forties blue, I was so excited to see it on the catwalks and very disappointed by the high street’s offer afterwards! Obviously I did not see this coat, but I like it a lot! I love love love my Baker Boy cap! I got the black corduroy one and ever since purchase, it’s pretty much never left my head. I look forward to collecting more! THIS IS AMAZING NEWS! I can’t wait to see you rock it! I *need* something in forties blue, I’m keeping my fingers crossed and hope that I’ll find something on the high street ?? (Fun fact: in Italy we call forties blue “blu carta da zucchero”, sugar paper blue, because sugar used to be package in paper of this colour, and I find it really cute). Oh wow how gorgeous that forties blue is named that in Italy, I LOVE that! I love the color combination! and baker hats have become my must-have of this season! I’ve grown a love for baker boy hats to, the only thing is none of the styles in the high street stores seem to suit me. If you’re looking for some really vintage, unique ones hit up the kilo sale in the northern quarter, I’m sure you’ll know where I mean next to Blue Rinse vintage. 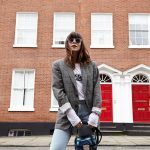 I went the other week and picked up 4 amazing vintage baker boy hats plus so much other good stuff for £15, definitely worth a look! Really? That surprises me as I seem to feel that baker boy caps suit EVERYONE! Have you tried the ones in Topshop? 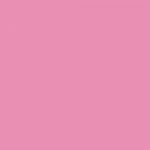 I am obsessed with the colour of this coat, it is DREAMY!